Well, it was that time again. The oil change was due for my Moto Guzzi California motorcycle. I’ve written about how I do an oil change before. 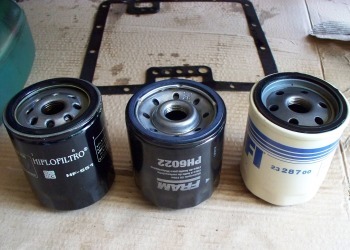 This time I am writing about different 10w60 oil and oil filter choices for the Guzzi. 10w60 full synthetic 4T oil is specified by Moto Guzzi for the late model version of the 1064cc air cooled v-twin in the California Vintage. The problem is that this grade of oil is not very easy to find. Unless you have good dealer near you that keeps it on the shelf, looking for it locally is usually not worth the time and effort. I’ve been there done that. Some KTM motorcycles also require 10w60, but even the local KTM dealer didn’t have any. I decided to just go ahead and order the oil online. I bought this elusive lubricant at Motorcycle Superstore, an American online motorcycle parts and accessories store that I often buy from. I’ve purchased many things things from them over the years and have always had good experiences doing so, including the Bridgestone BT45 tires and the 35 watt bulbs that I use in my auxiliary lights. This time, I decided to give Motul 7100 10w60 a try for 3 reasons. First, it had the lowest price for 10w60 that I could find anywhere. Second, the specs very closely mirror those of the factory-recommended Agip brand oil. Third, the nearest Moto Guzzi dealer is an irritating 120 miles west from me. I don’t get out to western North Carolina as often as I should though. There are word-famous motorcycle touring roads out there like Tail of the Dragon and much more. The last time I changed my oil, about 5500 miles ago, I bought a 4 liter bottle of Motorex 10w60 full synthetic 4T. This also matches the factory specified Agip oil very closely. 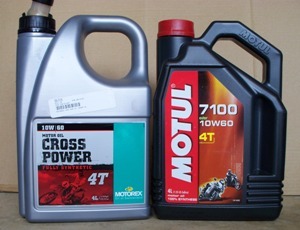 Motorex has the same oil with 2 different labels: Cross Power and Power Synt. It does not matter which label you get, both are the same exact oil. I was satisfied with the Motorex, but the Motul was on sale this time, so I thought why not give it a try. The 4 liter bottle of Motul 10w60 oil arrived safe and sound to my front door from Louisville, Kentucky within a couple days. Next on my shopping list was an oil pan gasket and an oil filter. I ordered those items from MG Cycle, a Moto Guzzi dealer located in the beautiful state of Wisconsin (I never rode a motorcycle there, but visited Wisconsin several times during travels for work). Because it was getting time to adjust my valve clearances, I ordered a pair of p/n 976139 valve cover gaskets in addition to the UFI oil filter (p/n GU3015300) and an oil pan (sump) gasket. 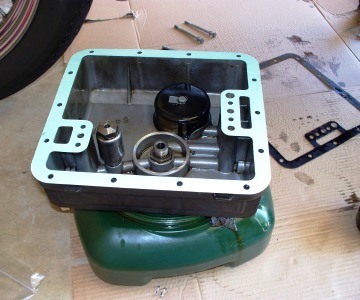 This time I ordered the thick green sump gasket (GU14003601) instead of the thinner gray/black sump gasket (GU14003600) that I used last time. I had no problems at all using the thin gray one, but I remembered that the dealer that did my first service, a few oil changes ago, used the thick green gasket and I was impressed with the quality of it. As a side story, MG Cycle had a mix-up and sent me the wrong oil filter by mistake. After I notified them of this, they quickly shipped the proper filter to me without any problem. My thanks go to MG Cycle for promptly making good on my order without any hassle. That is good customer service and I’ll be back again as a customer. Speaking of oil filters for the big block Moto Guzzi, there are a few choices. The UFI 2328700 oil filter (made in EEC according to the box) is the original equipment one from Moto Guzzi. One cross-reference for it is the HiFloFiltro HF-551 (made in Thailand according to the box). This is what I used last time and saw no problems with it. Another cross-reference is the Fram PH6022 (made in USA according to the box). Of these three that I bought, the Fram has a slightly different shape to it inside as shown in the photo. That may be more about manufacturing technique than anything else. I’m not qualified to tell you which oil filter is actually the best performing and safest to use in your Moto Guzzi. 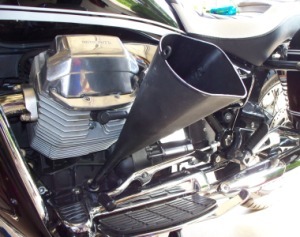 Obviously, Moto Guzzi uses UFI filters for one reason or another. Could be because of the quality, or perhaps because of some marketing deal, a pre-established history, or because they are made in Europe. I’d guess that they use UFI filters and Agip lubricants for all of those reasons. My perception is that that UFI filter seems to be the heaviest duty of the three that I have tried so far. 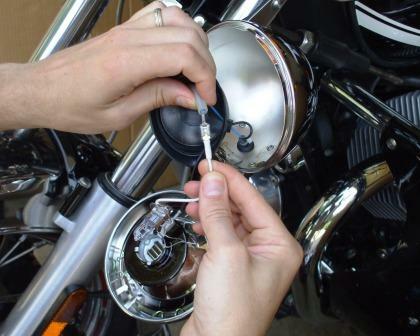 Installing 35W fog light bulbs is a simple way to reduce battery drain on a Moto Guzzi California Vintage. I explain and show photos how I replaced the factory 55 Watt H3 bulbs with 35 Watt H3 bulbs on my 2007 California Vintage. I have no idea why I waited so long to do this. need to change my air filter on 2014 norge, don’t have a book on it anyone please tell me what to look out for when taking off my fuel tank? does, don’t’s Thanks what filters are people using? Hi Wayne, yes, I stop in there occasionally, Jim there was a big help to me when he was at Union Cycle when I originally bought my California Vintage in ’08 from Carl, I still miss Carl’s shop. John There is a Moto Guzzi dealer in Matthews , NC Matthews Fun Machines, E. Independence Bv(US 74) that carries the oil you need. I have been using Amsoil Synthetic oils and lubes in all my Moto Guzzis since 1975. No issues, no leaking seals, and even extended drain intervals with no issues. My most recent Guzzis, a Breva 1100 and California 1400 which IO bought both new I have been using Amsoil 60 V-Twin motorcycle oil which meets and exceeds the requirements and has a -29 below zero F pour point. 52,000 on the Breva and 28,000 on the Cali 1400 and absolutely no oil add needed even on extended drain interval on my 12,4000 mile Alaska trip. My dealer installed Amsoil 80-90 in the gear boxes at first service. The final drive, ( rear diff) calls for 30,000 mile drain service. I just changed mine today at 28,000 miles and it looked like it came out of the bottle. Very minimal metal hair on the magnetic plug. I’ll continue to use it. Well over a half million miles on Guzzis with Amsoil and no failures. It was very helpful all your info on the oil change since I am new to moto guzzi. I was wondering if you have any advice on the Stelvio 1200 model for oil changes.I’m loving the on/off road capabilities because at some point in time I will dare to make a trip to Mexico.So any piece of advice is welcome.The motorcycle is new so I’m learning from the bottom. Good article, comments. Although the Fram filter may be listed as a match DO NOT use it. I know the company replaced at least one V11 Sport engine because the filter failed. Even if the UFI is ten bucks more, are you kidding? Why take the chance. John, It’s always good to hear your viewpoint on these things. Oil has been (and always will be) a topic of discussion among motorheads. I remember the old Havoline TV commercial where a car is limping down the road with smoke pouring out the back and the engines just knocking to beat all hell. The passenger looks over at the crusty old gent driving and asks what kind of motor oil he uses. Without any change in expression the driver croaks, “motor oil is motor oil”. I too can say only good things about MG Cycle. My son and I rode through Wisconsin last summer and stopped there to buy a clutch cable for his V65. They have boxes of parts stacked to the ceiling and, while we were there, the phone rang off the hook. They still took time to be helpful to my 22 year old son and even loaned him a pry-bar and some advice in helping him with his cable replacement. We were back on the road in no time and rode through some of Wisconsin’s nice back-country. Anyway, it’s good to read your articles and if you ever want to stretch the legs on your Vintage come out and see some REAL motorcycle roads. (Yes, I’d like to ride the Dragon’s Tail also).